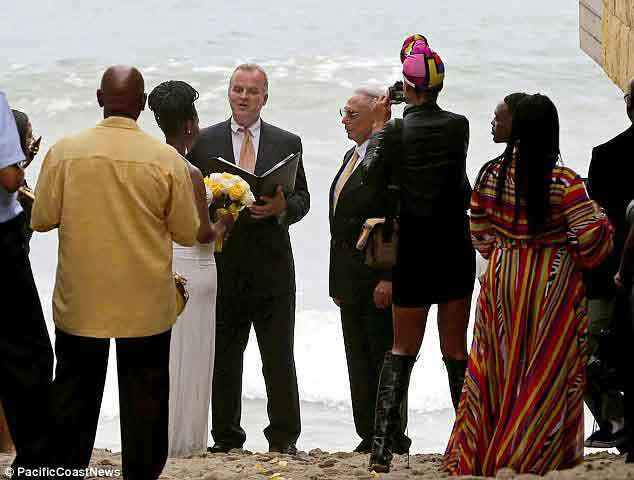 Chris, the Officiant Guy, married a couple on the beach in Malibu in August 2014 and the next day the a photo of the beach wedding made it to the major newspapers and magazines. Unbeknownst to him, he married the father of The Real Housewives of New York star, Aviva Teichner to his bride, Dana Cody. The story appeared in publications such as US Magazine and the Daily Mail. Chris is a wedding officiant for beach weddings up and down the Southern California coast, but Malibu beach weddings are the most popular. Plus, it’s not uncommon for Chris to marry celebrities. Once in a while it is publicized, as in these RHONY stars, but rarely does he not know that it’s a celebrity wedding. He treats everybody the same, nonetheless. HEADLINE: Something to do with the 51-year age gap? Real Housewife Aviva Drescher, 43, is a no-show as father George Teichner, 76, marries Dana Lavette Cody, 25, in Malibu. She has spoken out in support of her father getting married to a much younger woman, despite a whopping 51-year-age gap. But Real Housewives Of New York star Aviva Drescher, 43, still couldn’t find the time to attend the wedding between father George Teichner, 76, and his 25-year-old bride Dana Lavette Cody on Sunday. The odd couple tied the knot in an intimate ceremony in Malibu, but Aviva was nowhere to be seen. CAPTION: The odd couple: Real Housewife Aviva Drescher, 43, is a no-show as father George Teichner, 76, marries Dana Lavette Cody, 25, in Malibu. Cody wore a traditional white gown for the big day, with matching white sandals and her hair worn up, while George went for a smart suit. But not everyone agrees with his understanding daughter Aviva.